Simon & Schuster, 9780684846224, 288pp. Discover healing that reaches beyond the self. In this landmark work, Marianne Williamson reminds us that there is a point in everyone's spiritual journey where the search for self-awareness can turn into self-preoccupation. All of us are better off when contemplation of holy principles is at the center of our lives. But it is in applying those principles in our lives that we forge the true marriage between heaven and earth. In the compassionate but clear-eyed prose that has won her so many avid readers, Williamson shows us that the principles which apply to our personal healing also apply to the healing of the larger world. 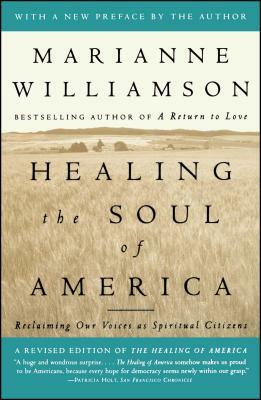 Calling on Americans to turn the compassion in our hearts into a powerful force for social good, Williamson shows us how to transform spiritual activism into a social activism that will in turn transform America into a nation seriously invested in the hope of every child and in the potential of every adult. Patricia Holt San Francisco Chronicle A huge and wondrous surprise....The Healing of America somehow makes us proud to be Americans, because every hope for democracy seems newly within our grasp. Jann Mitchell The Oregonian A long-needed breath of fresh air. Yoga Journal This stirring departure from Williamson's usual subject matter cuts to the heart of our dilemma and brings new energy to the search for solutions.